Question: If the district has a confirmed case of H1N1 (Swine Flu) will the district close school? Question: How has the district prepared for H1N1? The district has purchased hand sanitizer for each classroom. Hand washing posters are displayed in each school. Principals and nurses have been given a list of preventive measures to share with all staff and students. Effective communication plans have been developed to inform our community. Informational Podcasts from the Centers for Disease Control and Prevention have been posted on our website for students, staff, and community to view. Question: What do I do if I get flu-like symptoms? The novel H1N1 flu virus is causing illness in infected persons in the United States and countries around the world. CDC expects that illnesses may continue for some time. As a result, you or people around you may become ill. If so, you need to recognize the symptoms and know what to do. The symptoms of novel H1N1 flu virus in people are similar to the symptoms of seasonal flu and include fever, cough, sore throat, runny or stuffy nose, body aches, headache, chills and fatigue. A significant number of people who have been infected with novel H1N1 flu virus also have reported diarrhea and vomiting. The high risk groups for novel H1N1 flu are not known at this time, but it’s possible that they may be the same as for seasonal influenza. People at higher risk of serious complications from seasonal flu include people age 65 years and older, children younger than 5 years old, pregnant women, people of any age with chronic medical conditions (such as asthma, diabetes, or heart disease), and people who are immunosuppressed (e.g., taking immunosuppressive medications, infected with HIV). If you are sick, you may be ill for a week or longer. You should stay home and keep away from others as much as possible, including avoiding travel and not going to work or school, for at least 24 hours after your fever is gone except to get medical care or for other necessities. (Your fever should be gone without the use of fever-reducing medicine.) If you leave the house to seek medical care, wear a facemask, if available and tolerable, and cover your coughs and sneezes with a tissue. In general, you should avoid contact with other people as much as possible to keep from spreading your illness, especially people at increased risk of severe illness from influenza. With seasonal flu, people may be contagious from one day before they develop symptoms to up to 7 days after they get sick. Children, especially younger children, might potentially be contagious for longer periods. People infected with the novel H1N1 are likely to have similar patterns of infectiousness as with seasonal flu. If you have severe illness or you are at high risk for flu complications, contact your health care provider or seek medical care. Your health care provider will determine whether flu testing or treatment is needed. Be aware that if the flu becomes widespread, less testing will be needed, so your health care provider may decide not to test for the flu virus. Question: How can I help prevent the spread of H1N1? 1. Teach your children to wash their hands often with soap and water or an alcohol-based hand rub. You can set a good example by doing this yourself. 2. Teach your children not to share personal items like drinks, food or unwashed utensils, and to cover their coughs and sneezes with tissues. Covering up their coughs or sneezes using the elbow, arm or sleeve instead of the hand when a tissue is unavailable. 3. Know the signs and symptoms of the flu. Symptoms of the flu include fever (100 degrees Fahrenheit, 37.8 degrees Celsius or greater), cough, sore throat, a runny or stuffy nose, body aches, headache, and feeling very tired. Some people may also vomit or have diarrhea. 4. 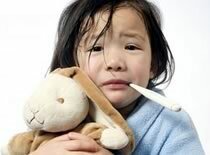 Keep sick children at home for at least 24 hours after they no longer have fever or do not have signs of fever, without using fever-reducing drugs. Keeping children with a fever at home will reduce the number of people who may get infected. 5. Do not send children to school if they are sick. Any children who are determined to be sick while at school will be sent home.